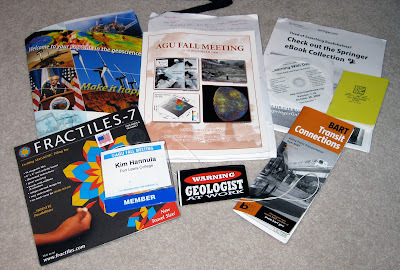 Counter-clockwise from top left: AGI's new materials for attracting students to the geosciences; my meeting program (with my scribbled notes from one session inside it); a publisher's book list; a CD from William Prothero, who spoke in my session; a free mini-fieldbook; a public transit map; a sticker from GSA; my name badge (along with a holder that I forgot to recycle); and a cool magnetic shapes game for my son (because it's never to early to learn about rotational symmetry, even if it's 7-fold). Yay for the new camera! I have the same sticker and put it on my Tule rooftop box. Sticker should go on the aluminum clipboard that goes out in the field with you. Or alternatively your front door! Put the sticker on your office door, if there's room.